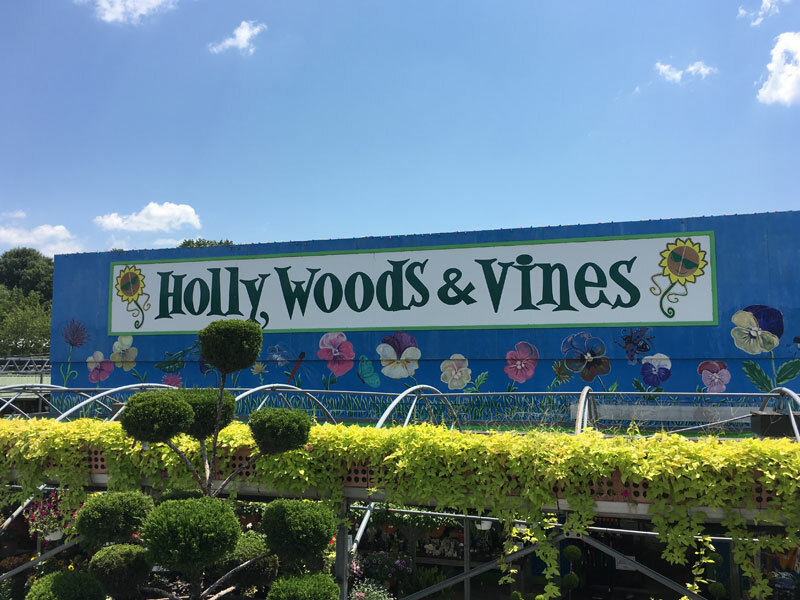 Holly, Woods, and Vines Garden Center, located in Southern Alexandria, at 8453 Richmond Hwy, situated on 3 acres, offers the fervent and novice gardener an extravagant selection of plants, trees, and shrubs. HWV prides itself on selection, from colorful garden accent annuals and hardy staple perennials to magnificently shaped topiaries. Walk through the vast field one is easily tempted by the dramatically draped branches of the Japanese Maple and its eye-catching, fire-red, leaves or the unusual, but handsome, Espaliered Magnolia; its outstretched branches boasting glorious white blossoms. Or perhaps, you're keen on the unique, rustic, yuccas with their regal crowns. In addition to the large assortment of lovely flora, HWV also offers an equally extravagant selection of brilliantly-colored, glazed, ceramic, pots, stately concrete planters, shabby-chic cast iron urns, and fountains, romantic to contemporary, to accent your lush, backyard, oasis. You will also find an abundance of stones and pavers to flank your garden or build a new patio. And to adorn that patio, and afford you the most advantages view of your garden, HWV is the perfect place to shop for today’s most comfortable, stylish, and practical garden furniture. Whether you prefer a weather resistant wicker sofa and rocker, a black powder coated iron chaise lounge, timeless teak dining table and matching chairs, classic concrete benches, or the more fanciful mosaic bistro, HWV is sure to have just the right pieces to entertain. While shopping for all your garden and lawn care needs, you will undoubtedly fight, and lose the impulse to buy wonderful gift items. Stroll through our two large greenhouses and discover HWVs treasures: an array of garden accents, stakes, gazing balls, and well-crafted garden gnomes and frogs, all sure to be perfect for your hard-to-shop-for friend or family member.